This is perfect for the kitchenette and it coordinates well with the matching runner In the long hallway. It is tick and feels nice on your feet too. I am so glad and satisfied with this purchase. The delivery was unexpectedly super fast! Safavieh Handmade Natural Fiber Barbados Chunky Thick Jute Rug - 5' x 7'6"
I purchased this rug and then decided it was too big for the area I wanted so I was intent on returning it. Before it had arrived I purchased a couple more rugs locally but they didn't work. I wanted to complete the "relaxing spa" feel of my bathroom so after reading more comments I decided I would see if it would work. It's perfect! Some have mentioned a musty smell (it is afterall, jute, a natural material) and one should expect a slight smell. I used Fabreaze and that eliminated it. The rug is a natural, relaxed floor covering, perfect for my ceramic tiled bathroom. I couldn't be more pleased and the larger size is actually better than if I had purchased something smaller. One comment regarding the material it is made from. The tag on the rug said "100%" jute but the manufacturer webpage also referred to it as "sisal." It's not sisal, it's jute which is a little coarser and not as soft but soft enough. Ordered this chunky thick jute rug for my bath! It meets everything in the description of it! Lovely dark brown in color and feels ok under foot, for a natural jute material! I was somewhat concerned about getting this for the bath, because of getting water on it, but I decided it looked so great, it was worth the try! I just simply throw a thick towel on to the rug, to step out on to absorb the water! No problems at all! This rug also has very nice fringe on the two long ends! No sign of anything coming untied or loose! The fringe is actually part of the weaving of the rug and is tied off well! You do need to shake it well, to loosen up and remove loose jute "trash"! Not really trash but something gritty from the jute being natural! Just shake it and no problems! I think this is how it would be cleaned, Nothing else would show on this rug! You will not regret purchasing this rug, if natural jute is what you are looking for! This bath has sculpted Venetian plaster walls in a natural beige, brown, little bit of orange rubbed on and little green rubbed on! This creates a real vintage Italian, beachy look in the bath!! Rug over the light wood floors, looks fantastic! This is a fairly large rug! Oh, I do have a lightweight pad underneath, to prevent slippage on the wood floor! Arrived on schedule and in perfect condition! Highly recommend buying this rug! You will not regret it! Do not be mislead by the title of this product, it is not, in fact, "sisal". It is made of jute, which is a similar fiber. I actually don't mind one bit that it is jute and not sisal, but for the purpose of the review, I feel I should mention that the title is incorrect. The product is well made, arrived promptly, and in great condition. I have had this rug in my foyer for about a month now, and it still looks as good as it did the day I unwrapped it. I have cats who like to scratch at the rug, and it has held up nicely -- no damage whatsoever! I love the natual fibers and the organic nature of the rug. Other reviews mentioned an odor, my rug did not have any noticeable odor. The rug "shed" a little the first day I had it, but I used my shop-vac to get any stray fibers. The color is accurate as depicted in the photo. I do not have an anti-slip mat under my rug, and I haven't had much need for one. We have tile floors, and the rug stays put most of the time, though it is just my husband and me (no kids). All in all, a beautiful, well-made rug. This rug is WELL worth the price. I found other jute/sisal woven rugs that were not this well-made, but were much more expensive. I love Overstock! Another great product and another happy customer. They always have a great selection of high quality items at a reasonable price. I highly recommend this rug. Note of warning to anyone: the pile thickness was incorrect in the description. It is more like 3/4", not 1/4". Would not clear under my door - Overstock still charged me a return fee even though the description was incorrect. 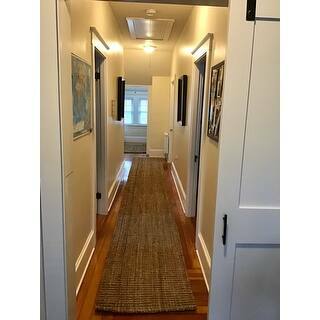 I had already purchased a 100% jute rug with fringed border for my entryway. Since i wanted a rug for in front of my kitchen sink I did not want the fringe border. I almost passed this one up because it said fine sisal but after reading the reviews that it was 100% jute I bought it. I could not be more pleased. It is so well made, thick and soft to stand on and looks amazing with my hickory cabinetry. The golds and browns(the picture seems more beige to me) compliment the kitchen so well. I would buy this one over and over again. You cannot beat the price and quality of this rug. This 3-x-5 Safavieh Casual Natural Fiber Hand Woven Natural Accents Chunky Thick Jute Rug is just what the name implies. It is chunky and thick, no wasted space or material in this rug. A rug that will stay in place and hold its shape, you won’t be picking up this rug to shake it out. Love this rug ! Perfect size and color! Great quality! In love, beautiful rug but not low maintenance. This is a beautiful rug. I have this rug in my entry way. Like other reviews, it's thick and might be too tall to go under the front door when it's opening. Mine is not close to the front door but I tried it and it was pretty hard to open the door over the rug. The rug looks just like the picture. The color is such a beautiful blend of caramels and it's nice and soft in bare feet. My only problem with the rug is the durability and cleaning in my environment. We have 2 Great Danes and 3 Brussels Griffons and at times the rug becomes a target for slip in slid events even with a mat underneath. I think they do it on purpose :) so tufts of threads have pulled through almost unraveled in spots in the middle. I have been weaving/pulling the tufts back into the rug when this happens which is not often. Cleaning is a little harder because of the texture and thickness but it does vacuum well. You just have to keep up with it often because dirt will accumulate underneath it. I don't mind the extra effort of mending and care because it's such a great rug for my space. The price is so great I bought a second one a as a back up. This would be a dream rug in a area with minimal traffic. I did not find this rug to smell at all. A previous description mentioned it smelled like hemp, but I did not find that. I have a gray tile with tan accents so the tan colored rug blends beautifully. Works perfectly for our entryway and front door. I would buy again. My new hand woven chunky jute 3 x 5 rug fits beautifully in my condo. I've aquired my home from my parents and will be redoing the inside. I will have dark plank wood floors which will really make this rug stand out in the entryway. I love the feel of the rug, and living in Soutern Florida, this is such a great accent rug. Thank you Overstock. I received this 3x5 rug today and it is thick and wonderful under my bare-feet. It feels like a foot massage as it is nubby and a little spongy. I will be using this as a door mat on my covered porch but am seriously thinking about getting a bigger one for inside because I like it so much. For color reference this is several shades of blonde fibers twisted, knotted, and weaved together. The blonde colors range from a light blonde to a strawberry blonde to and dirty brownish blonde color. It would work for many shades of wood floors. If you need something thin I would go with something else. Great quality rug. Not sisal as the title says, but Jute, as explained in the description. Jute was what I was looking for, and exactly what I got. If you are looking for sisal, consider Jute instead. It has more texture and hides stains 300% better than sisal. The ends are folded upward and still wont lay down! But this is my second one, the first rug was perfect. A really beautiful rug that provided the textural element I was looking for. It does shed some so you need to move it out of the way and sweep under it every once in a while but it is a really nice looking rug for the money. Very nice, thick jute rug. I love the nubby look that it has and it doesn’t seem to shed like a lot of other natural fiber rugs that I’ve purchased. Such a nice, thick rug! Looks just right under my coffee table!!! Obviously not a soft material but has held up well. I have used it in my entry way. We ordered these for the office and they look really great together. Look like they hold up to wear and tear. We've had this for about a year now. Very nice looking jute rug but not for high traffic areas. We cut the loose ends that fray. So far it's hanging in but it can't handle a heavy vacuum. "Is there a tiny bit of black in this jute?" There does not appear to be any black in this rug. Please note that some colors may vary due to dye lot variation from production. "Can this rug be vacuumed or does it need to be shook to get cleaned?" Definitely yes, it can be vacuumed. It's beautiful. Love it. "I am planning to purchase this for my office, over a wood floor. Will my office chair roll easily over it or should I use a chair mat?" It's thick and pretty "nubby" so I would think you'll need the mat. I had it in my home office for a while and my office chair rolled on it fairly easily; I'd try it without one first. I ned to amend my response. I had bought two different jute rugs and I thought this comment was for the other one. THIS rug definitely should not be used under an office rolling chair! It's far too nubby. "Does this rug shed like some of your other rugs have said in the review sections?" All rugs will shed to a certain extent and this will decrease with time. It is unwrapped but not yet in use, so unfortunately I cannot tell you. I did NOT notice any issues when unwrapping. I haven't had any issues with shedding at all. "Is this rug exactly 3' x 5'?" "I recently bought this rug for my patio. Is it for indoor use only? Can it get rained on? Thanks"
Jute rugs, do not like to get wet and a jute rug should not be used where there is a high moisture content. Jute is a plant fiber and turns brown and yellow, when it gets wet and holds onto odor, like you can't believe. "Do you recommend this item for entry hall wall? What kind of pad do I need? Is it very high rug? What is the height? Hope it is not too high for my entry double door. my door is open inside my house." Hello Bench8, the pile height for this rug is about ¾ of an inch. We recommend customers purchase a rug pad for our rugs as it will increase durability of the rugs and will prevent some scratches on floors. Have a great day! Does it come in a larger size and how do you clean it? Hello! smile... I would like to know how to clean this rug and does it come in a larger size?